Before the overthrow of the Allende government in 1973 there was little knowledge of Latin American culture in Australia. The establishment of solidarity committees and the influx of refugees, asylum seekers, and others from Chile post-coup resulted in a diversity of activities to build awareness of what was occurring within Chile and to put pressure on the military regime. Of great importance in this work was the organization of cultural events, which included tours by prominent Chilean musicians. These attracted large audiences and led to a wider appreciation on the part of the Australian population of Latin American culture. The tours also stimulated the formation of Australian Latin American musical groups, Latin American cultural centres, and women’s groups, and the organization of solidarity events in which many ethnic performers from all over the globe participated. Central to this cultural upsurge was Mavis Robertson, a prominent member of the Communist Party of Australia, who chaired the cultural subcommittee of the Committee in Solidarity with the Chilean People in Sydney. 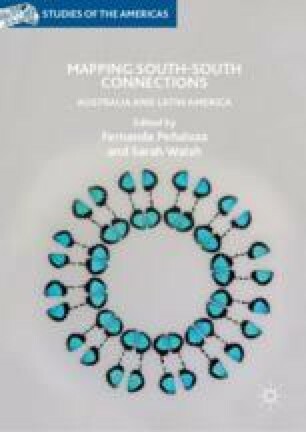 This chapter concentrates on her role as a central figure in a growing awareness of Chile, and of Latin America, in Australia after 1973 and continues to the present. ABC Radio. 2010. “Solidaridad!” ABC Hindsight, January 31. Presenter: Michelle Rayner. Producer: Ann Jones. Accessed July 19, 2016. http://www.abc.net.au/radionational/programs/hindsight/solidaridad/3108534. Connolly, Sharon. 2006. Activist Was a Passionate Proletarian. Audrey Blake, 1916–2006. Sydney Morning Herald, November 22. Accessed July 16, 2016. http://www.smh.com.au/news/obituaries/activist-was-a-passionate-proletarian/2006/11/21/1163871401000.html. McKnight, David. 2004. Australian Film and the Cultural Cold War. Media International Australia, May. Accessed July 14, 2016. http://www.davidmcknight.com.au/archives/2005/08/australian-film-and-cultural-cold-war. Sparrow, Jeff. 2012. A Short History of Communist Jazz. Overland, June 20. Accessed July 14, 2016. https://overland.org.au/2012/06/a-short-history-of-communist-jazz/. Super User. 2009. Joan Jara recibe nacionalidad chilena por gracia en Palacio de la Moneda. Palabras de Joan Jara. El Sitio de Yungay, June 3. Accessed December 12, 2016. http://www.elsitiodeyungay.cl/index.php/using-joomla/extensions/components/content-component/article-category-list/438-joan-jara-recibe-nacionalidad-chilena-por-gracia-en-palacio-de-la-moneda. Youth Leader to Speak on Asia Struggle. 1950. The Guardian, February 17. Accessed July 16, 2016. https://www.google.com.au/#q=youth+leader+to+speak+on+asia+struggle.